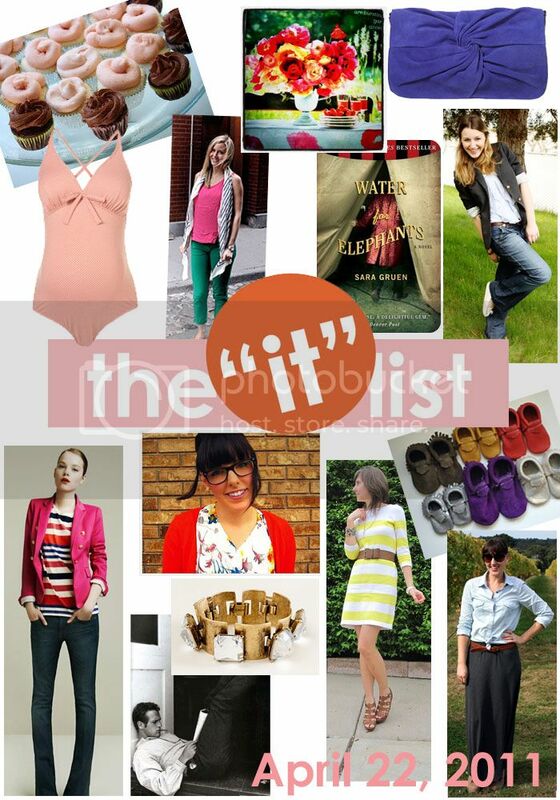 The Capital Barbie: It list!! Happy Friday ladies... I hope you all have a fabulous Easter weekend, whatever it brings to you. "Hop" on over to these fab blogs for plenty of spring inspiration! strong sense of style gives color blocking a try... it's so fun and easy! And really? What feels more properly spring than pink and green together? thought and musing wears a simple and elegant maxi skirt for some wine tasting... a perfect outfit for what looked to be the perfect day! good tots rounds up maternity poolside looks for summer, including this adorable peach polka dotted maternity swimsuit! a spoonful of dish reminds me that flowers never disappoint in the inspiration department. Just looking at them I can feel that summer is closer! lady m says what we are all thinking lately: we can't get enough of Zara. Check out the inspiration and some of their (very interesting) backstory over at her blog! the it list is produced each week by jill of good life for less... click here for information on how you can be involved! Girl, I am loving that gold bangle you chose!! It is so fun! I hope you have a wonderful weekend!!! xoxxo!